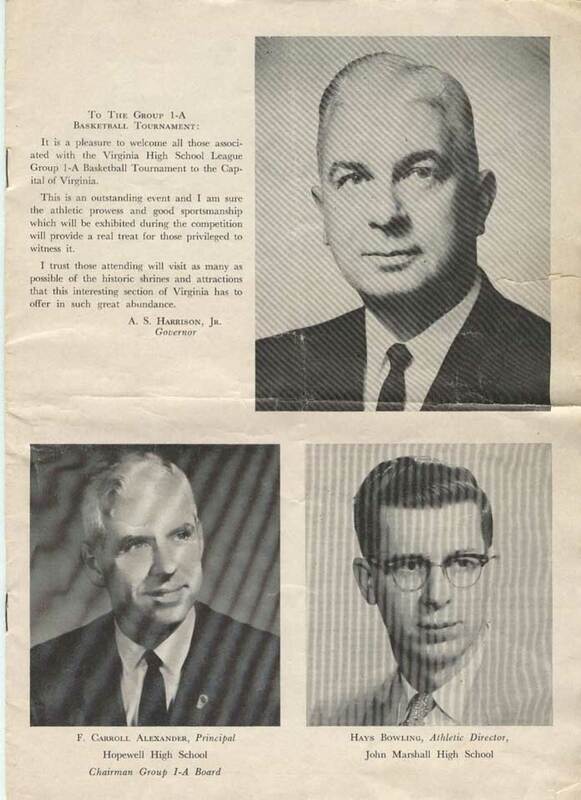 This page was created at the suggestion made by Dave Spriggs ('64) of VA on 03/25/04. Missing from the photo is Wayne Stokes. 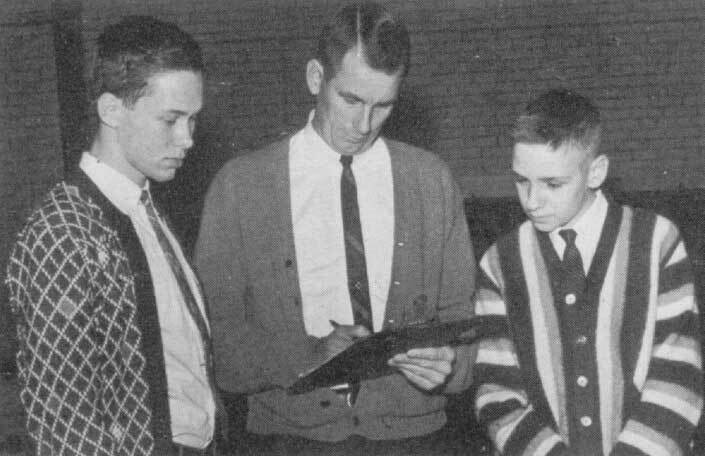 "Coach Mitchell shows varsity managers, Tom Buckingham and Mark Wimmer, the correct procedure for filling out the all-important shot chart." mainly because I was so devastated at having lost my own copy many years ago! Thanks so very much, Rick - and Dave! Oh, c'mon - after forty years, surely they can at last be told! 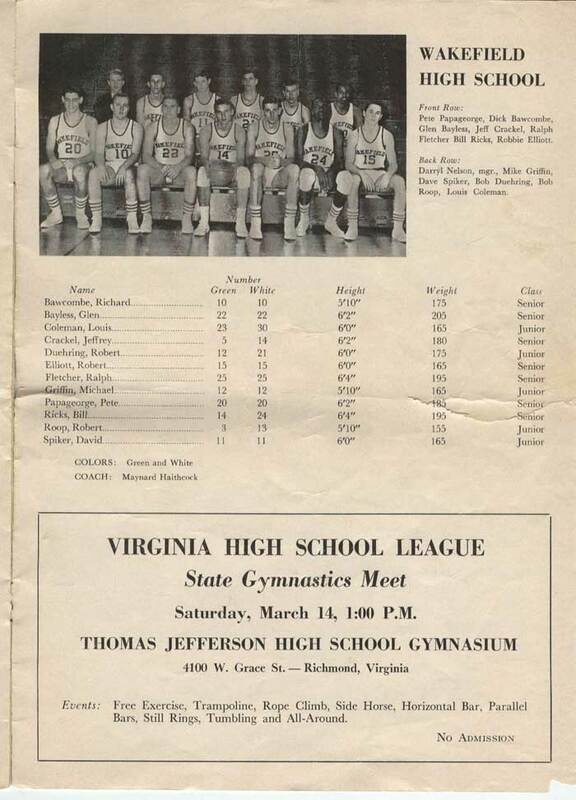 Its hard to believe that it has been 40 years since the Blue and Gold Typhoons of NNHS ran away with the 1964 Virginia Group 1A State Basketball Championship and completed a perfect 25 and 0 season. 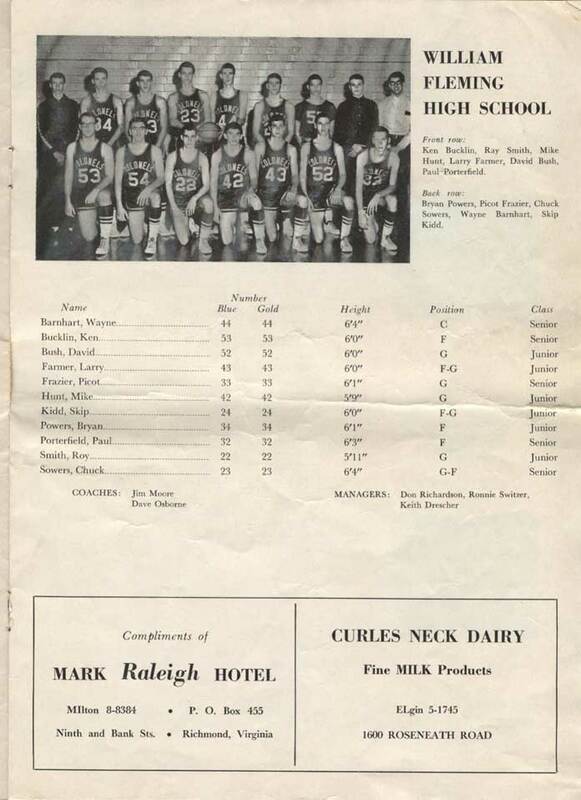 Its even harder to believe that this was the last state championship won by this basketball powerhouse before the school was closed after the 1971-72 school year. This piece is being written to refresh your memories, to shed light on some things of which you might not have been aware, but most of all to bring old friends closer together. You see, this championship, more than anything else that I can remember, represents the deep pride and tradition of NNHS, its students and its faculty. 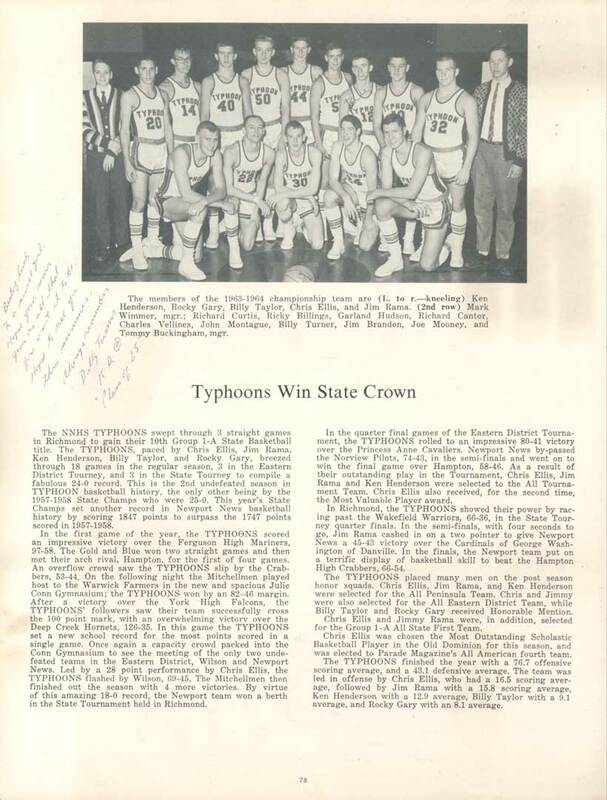 The quest for the 1963-64 basketball championship actually began in earnest in March of 1963 when the Typhoons lost to the eventual state champion, Washington and Lee, in the semi-finals of the 1962-63 state tournament. 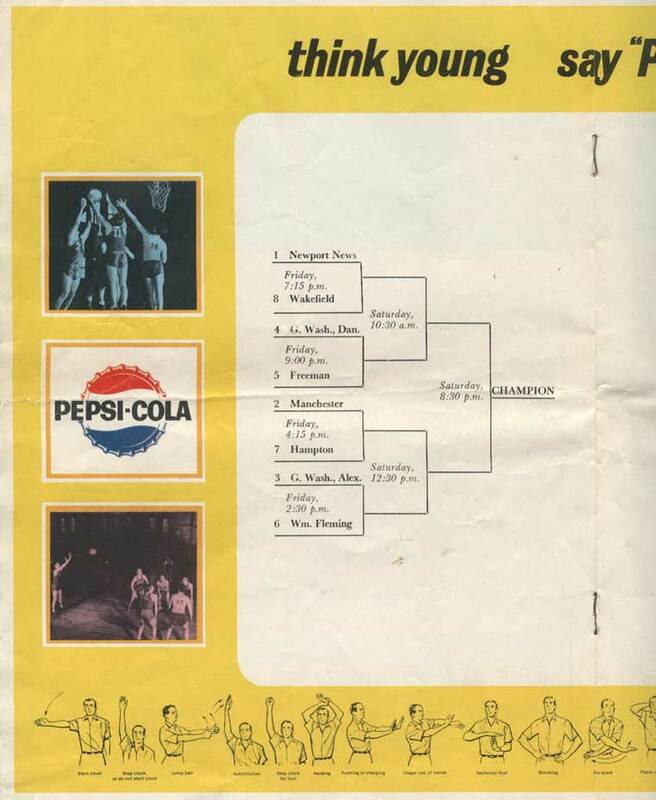 The returning members of that team vowed to win it all in 1964. Led by returning starters, Rocky Gary. 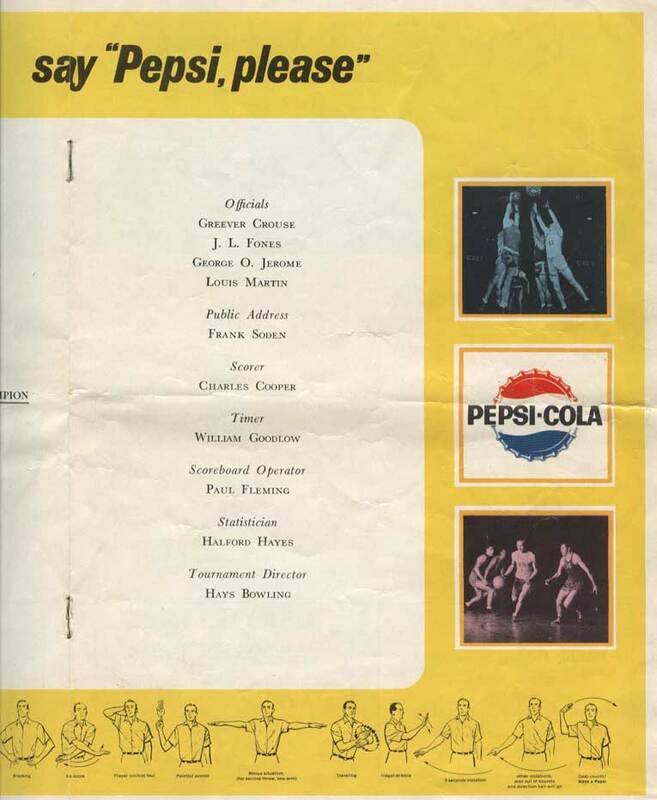 Jimmy Rama, Chris Ellis, Billy Taylor, and Kenny Henderson, and a strong supporting cast, made up of Richard Curtis, Johnny Montague, Joe Mooney, Richard Cantor, Garland Hudson, Ricky Billings, Jimmy Brandon, Charles Vellines, Wayne Stokes, and myself, Billy Turner, we spent hours in the gym honing our skills. To make matters worse, we were not only dealing with the pressure of wanting to win the state championship, but also a strong desire to extend the longest home court winning streak in the country to an unprecedented 88 games. The pressure was on, and we knew it. 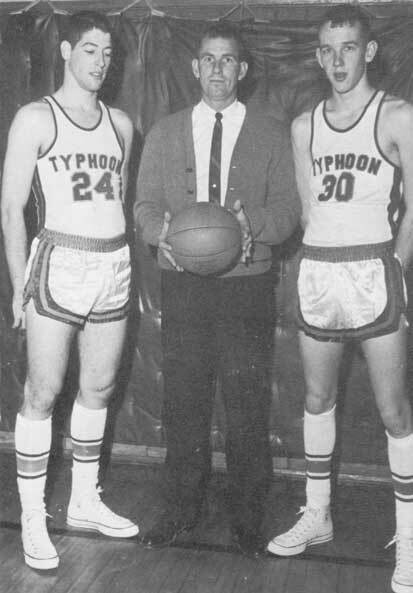 Our coaches, Warren Mitchell and his assistant, Johnny Palmer, were fine, intelligent men who cared for their players and truly believed that we could win it all. They pushed us to play summer ball and to work diligently in the weight room during pre-practice conditioning sessions, better known as last period gym. Of course, if they ever let down their guard, the coach of coaches, Julie Conn, would be in our face, sputtering and stammering like only he could do. 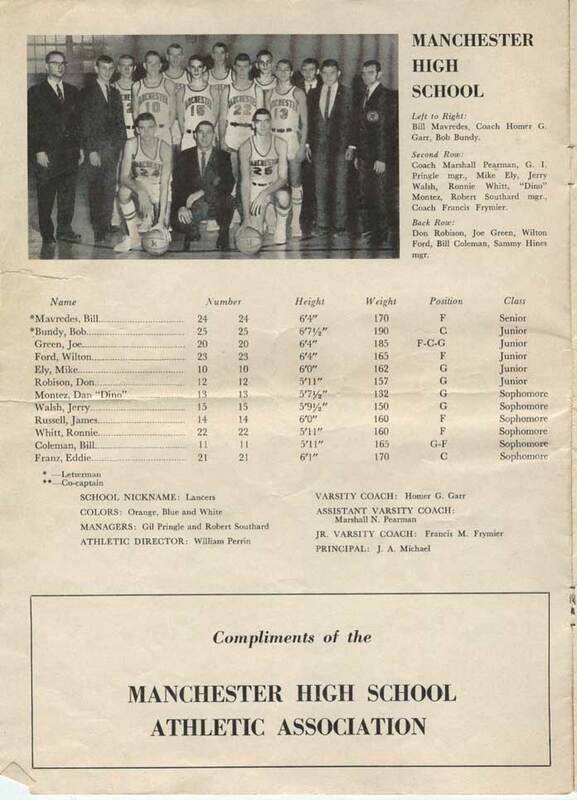 You see, Coach Conn was the first of a very short, successful list of varsity basketball coaches who graced the halls of NNHS. He started the winning tradition and he was determined to see it continued. 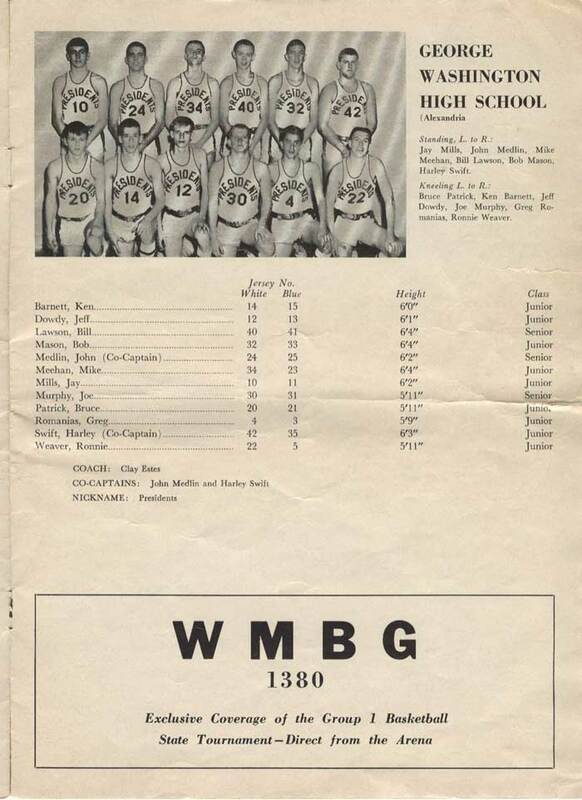 Others personally chosen by him to continue the storied tradition were Bill Chambers, "Lefty" Driesell, Warren Mitchell and Charlie Woollum, who replaced Coach Mitchell at the end of this championship season. Other than Coach Conn, every head varsity basketball coach in the history of NNHS became a head coach at the college level. Need I say more about a tradition of coaching excellence? As the basketball season neared, our team came face to face with several challenging distractions that could have wrecked our dreams of a state championship. First, practices were highly competitive and there was no backing down, whether you were a starter or a second team member. In fact, the second team would regularly whip up on the first team in full court competition. Tempers would often flare as team members tried to prove themselves worthy of playing time and recognition. On one occasion, our Co-Captains, Chris Ellis and Billy Taylor, went toe to toe in what could not be classified as a friendly, shoving match. Thank God, cooler heads prevailed and the team was not torn apart by that incident. Later, we had to overcome the distraction created by the death of our president, JFK , and as the season drew near, we had to deal with the opening of our new playing facility, which was being named after Coach Conn. Teams throughout the area were anxious to play us on our new home court. 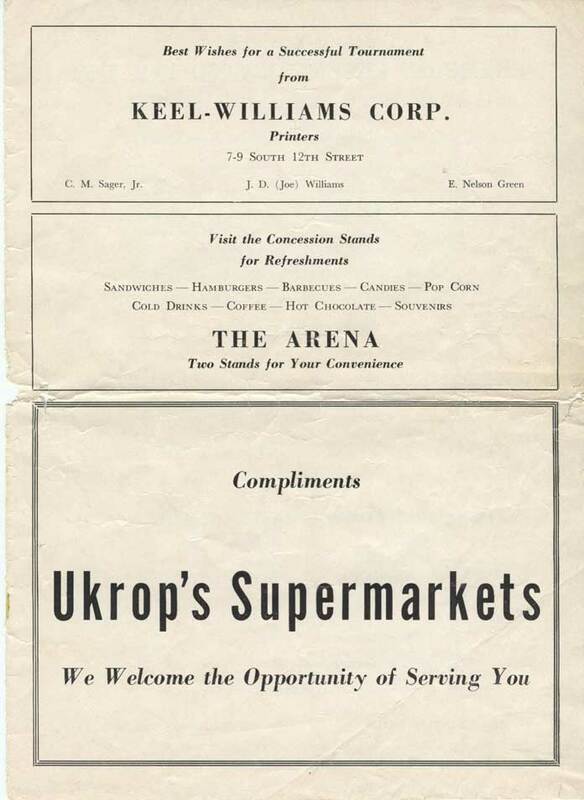 They figured anything was better than playing us in the dreaded "Pit" where we had won 75 games in a row, dating back to 1956. NNHS eventually did lose a game at home, but not this team or even the next, and not until the streak eventually hit 100 games. Once the season started, our opponents soon discovered that this team was for real. Pit or no pit, no one was going to beat us at home. 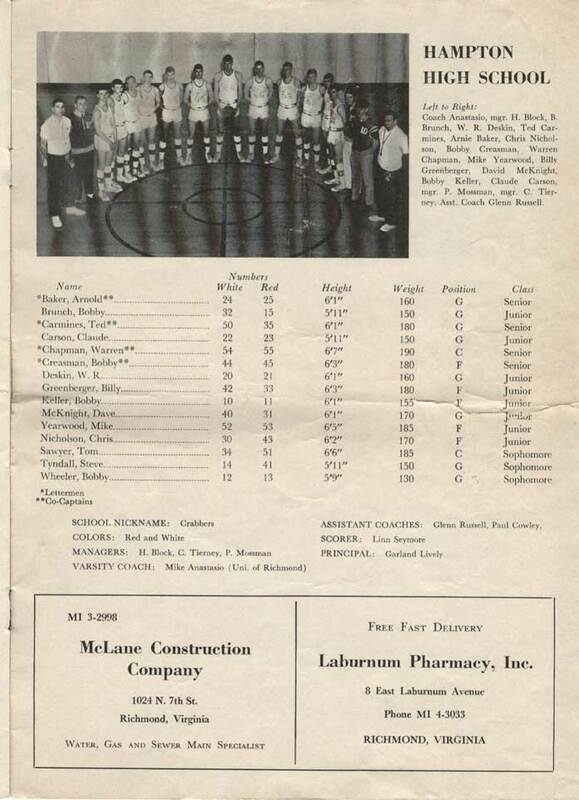 In fact, no one would beat NNHS at all, at any level of basketball competition that year. Not only did the varsity go undefeated at 25 and 0, but Johnny Palmer’s JV team finished 18 and 0, and the boys 8th and 9th grade team finished 10 and 0. Our closest competitor at the district level was our archrival, the Hampton “Crabbers”. We beat them twice during the regular season, in close hard fought games, 53 to 44 and 49 to 38, but we never thought that we would have to beat them twice more to win the coveted state championship. 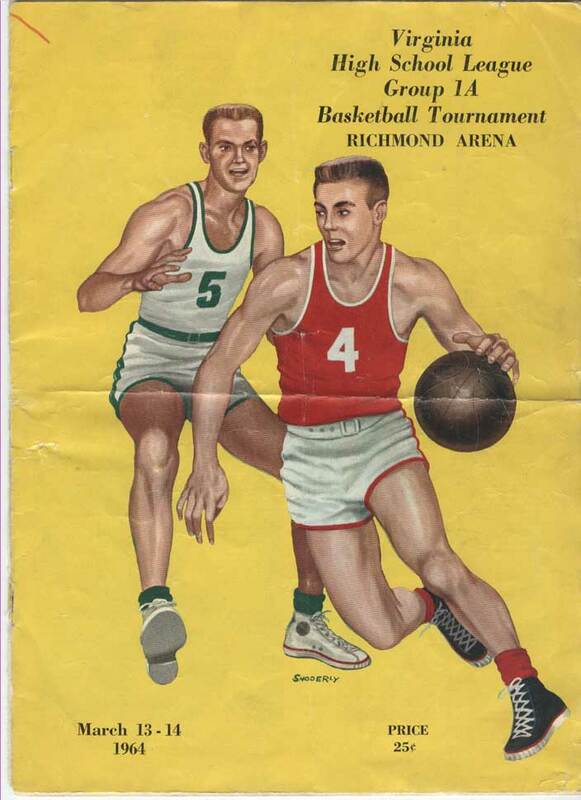 As luck would have it, we faced them again in the Eastern District finals, winning 58 to 46, and again in Richmond in the State Championship game, which we won 66 to 54. Do you realize how hard it is to beat the same team four times in a single season when both teams are so evenly matched? There can be no doubt that in this case the best team did win. I’ll never forget running off that floor with the championship trophy in our grasp, but there were a lot of other things I would not forget about that year. I can still see our esteemed band director, Mr. Jim Wilson, who also served as our official score keeper and basketball statistician, with excitement in his eyes and tears streaming down his face. I can remember our teachers and administrators who showed up at every game and truly rooted us to victory. I can remember the excitement in the halls, and in the student body, when we gathered for our traditional pep rallies. I can remember our cheerleaders, Pam Smith, Connie Todd, Dianne Adams, Pauline Collins and others who sweated and worked every bit as hard at their job as we did at ours. I remember the Typhoon Marching Band, the fight songs and the flagtwirlers, especially Betsy Smith, Mary Lou Staton, Nancy Horne, and Janice McCain, who performed at every pep rally. 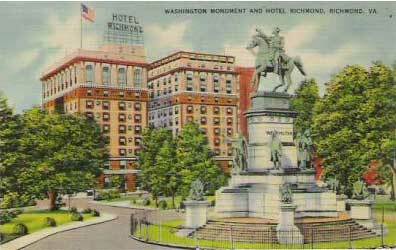 I remember the fun that was had by all in Richmond. I remember classmates smiling and laughing, away from home, perhaps for the first time in a un-chaperoned situation, and victorious over all. 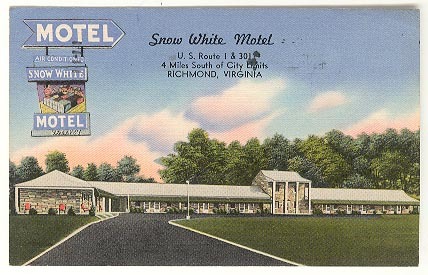 I remember the motel where the team stayed and the four R.P.I. nursing students, led by a former "Typhoon", who slipped into a room with four players after the semi final victory over George Washington of Danville, on the pretense of helping us "to get up for the championship game". 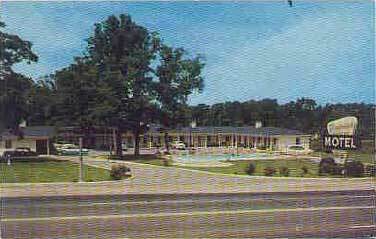 I remember Julie Conn, Jim Wilson and Johnny Palmer roaming the halls of that motel making sure that each of us got a good, undisturbed night's sleep. 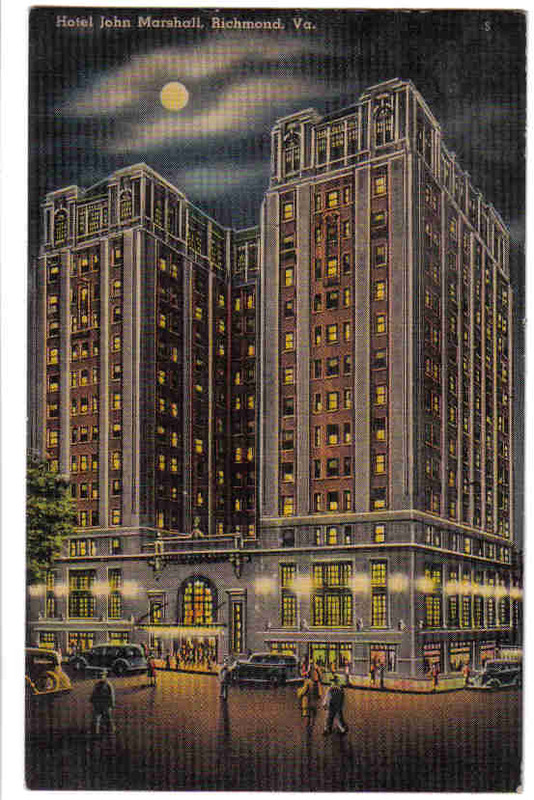 I remember the difficulty we had in getting those nurses out of our room without them being seen. Yes, I remember a lot of things about that time in my life, but most of all I remember the relationships that were built, relationships that still stand the test of time. Many of you I have not seen since graduation, but I remember you. I might not recognize you, or you me, but I remember you. Those memories are special to me, I’ll take them to my grave. I hope each of you is blessed with your own special memories of life as a “Typhoon”, just as I am. WOW! Thanks so much, Billy Turner - you've told the story from a unique perspective as only you could have told it! 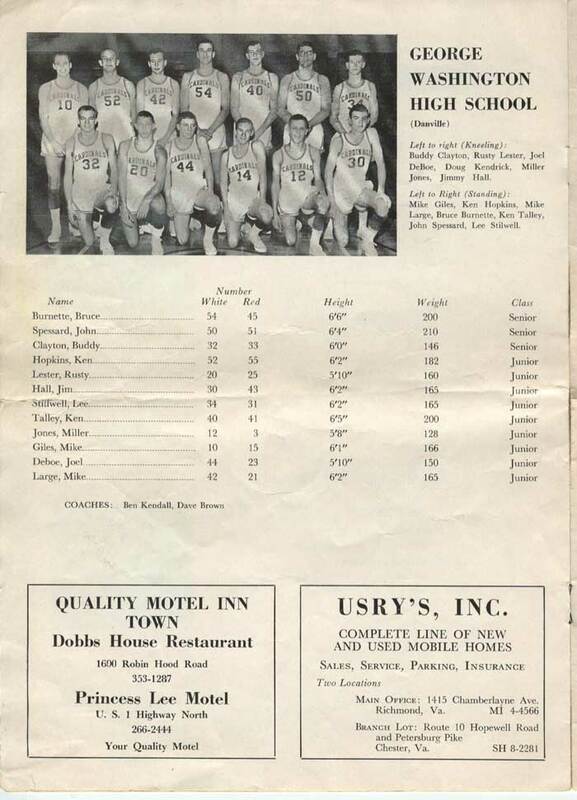 I will share a story with you regarding the '64 State Champs Basketball Team. In my attempt to help the class of '62 locate Coach (Warren) Mitchell, so that they could invite him to their (40th) reunion, I had the good fortune of having a nice conversation with him. When he answered the phone, verifying that I had the right person, I said you probably don't remember me and gave my name. He replied, "Of course I remember you, very well." Then he said some nice things, true or not, about my game. As the conversation went along, I asked him if he remembered us "second teamers" defeating the starters in a full scale scrimmage (that is a real game, clock, officials, the whole nine yards of a "real" game)? He replied, "Yes I do, not only once, but twice." He was right, I had forgotten the second game! 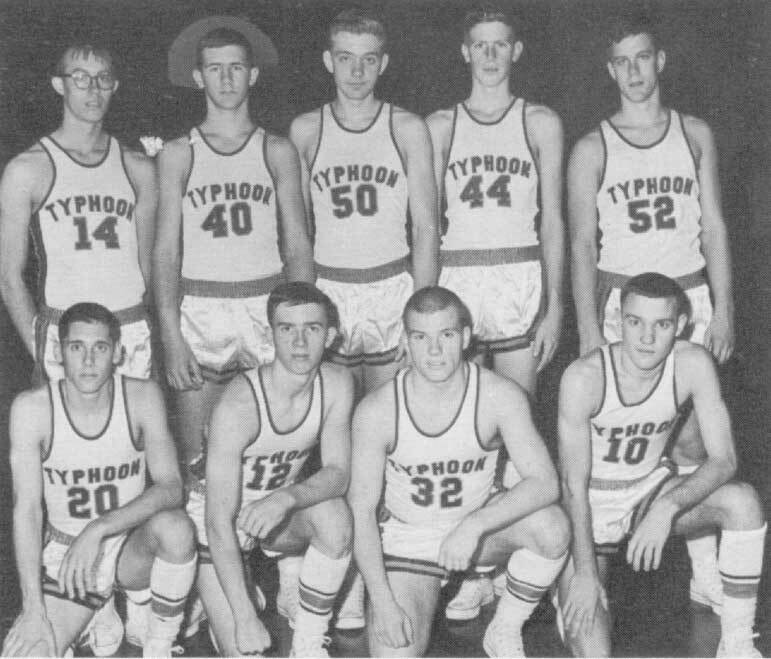 The next year( '64-'65) the Norfolk Paper, Virginian Pilot, had a preseason sports article about how no one should think that "this year's Typhoon team was going to be easy to beat." 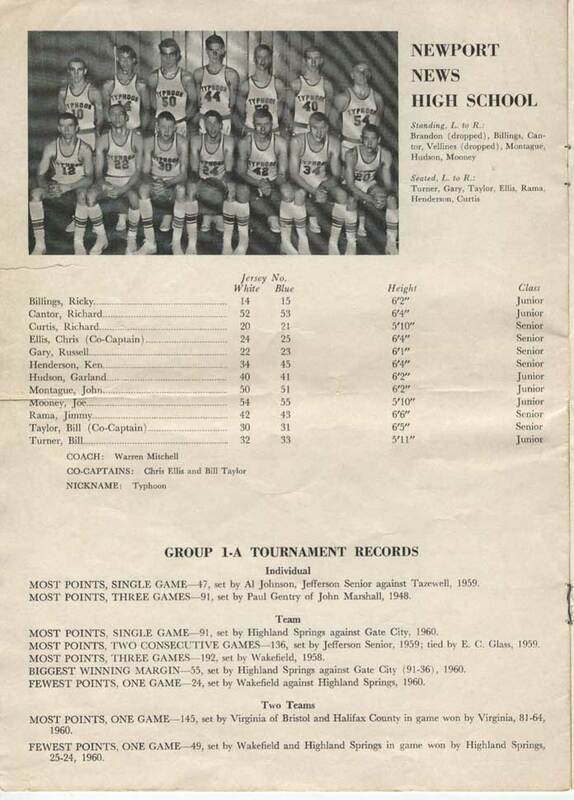 In case anyone didn't know, we ('65) were the only group to defeat last year's team in a full scale game. So shed no tears for NN! 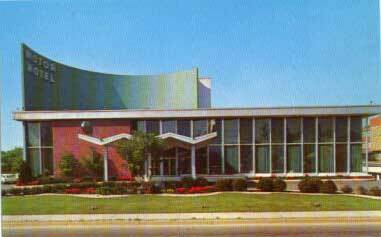 Also, some may not know this, '64-'65 was the first year of the existence of the Peninsula District. We won the title going 10-0 in district play. So there you have a little bit about both groups. The '64 guys were a marvel to watch! 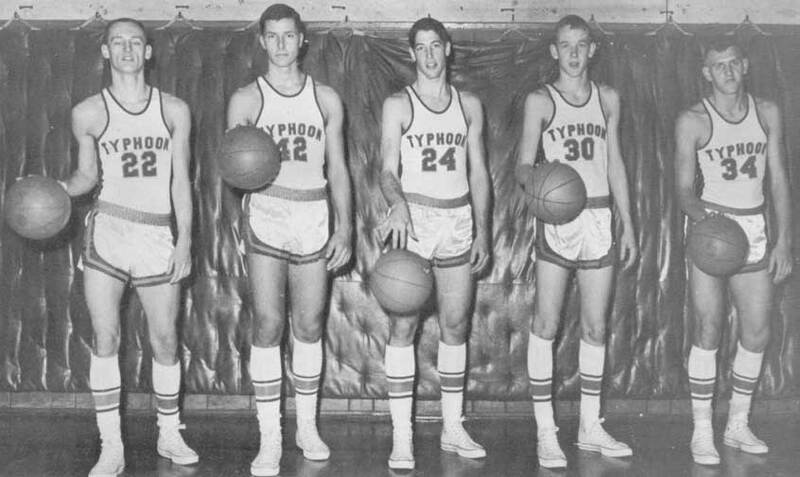 With that said, I would like to add that in my opinion the starting five of the 1964 team was the best starting five that NNHS ever put on the floor! Now, that's saying something about a group from a school known for it's basketball dominance. 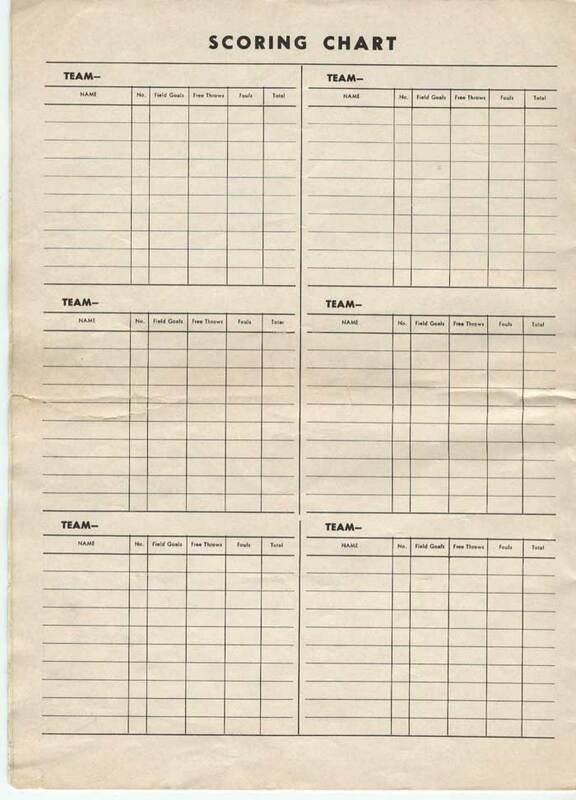 However, I do believe that the record book will support my position. "Our" winning against them in those scrimmage games was miraculous and certainly made us proud. At times, they were poetry in motion, no doubt. At the time of the 1964 State Championship Basketball Tournament in Richmond, my sorority, Theta Delta Chi, determined to go as a group. My mother, a.k.a. "the Baba", had naturally come along as our combination chauffeur/chaperone, because she was so much fun, and we all loved her. 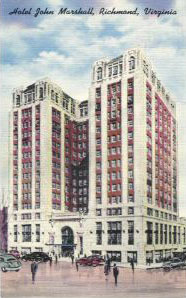 We stayed at the Executive. When party time came around, we loaded at least eight people - maybe ten - into her poor little turquoise 1960 Renault Dauphine (the springs were somehow never the same after that) and started making the rounds. Every time we'd get to a new door, the faces inside would register shock and horror at the sight of the 56-year old Baba, and Lynn (Walker) or Katie (Haan) would just say, "Oh, it's okay. That's Baba. She's cool. ", and the door person would hesitantly grant us entry. At the risk of completely humiliating myself, I'll share one more story which is indelibly imprinted on my mind. 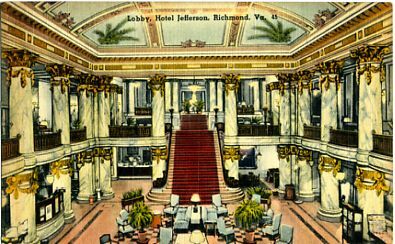 In making our party rounds, when we reached the Hotel Jefferson, I was completely taken by the magnificent staircase. I had always secretly entertained visions of myself regally descending those stairs a la Scarlett O'Hara in Gone with the Wind. The temptation was too great to overcome. I excused myself from the party, and approached the staircase, my fantasy fulfillment only moments away from my grasp. Certainly I was not dressed for the role, but my imagination could surely compensate for that. What I wasn't considering was my extreme astigmatism, which can wreak havoc on descending stairs, causing the feeling of falling even when no such danger exists. Scarlett didn't have that problem. Neither did Vivien Leigh. But I certainly did. I had taken two steps when the panic struck. I had no idea how I was possibly going to make it down those steps. I seriously considered sitting down and bumping my way down the way I used to do as a child - hardly the dignified descent I had imagined. Clutching the banister, I somehow made it down, but my ego was forever shattered. I took the elevator back up to the party, visibly shaken but admitting nothing. So much for noble dreams and aspirations. except when we got home the Richmond Times Dispatch editorial page was slapped in my face and the headline read, "The Grapes of Wrath" referring to Richmond being trashed by "us hoodlums from NNHS". 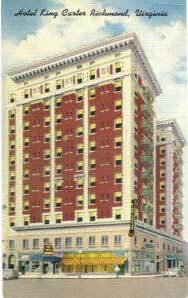 I do remember being there in '63 with the SLT and looking out the hotel window and seeing Steve Sparkman (I believe) hanging from the hotel flag pole that hung over Broad Street. 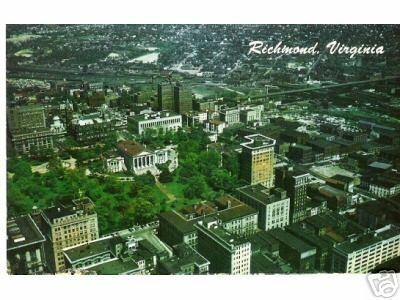 It was really more fun in '63 because Richmond was not prepared for us and we got away with a lot more mischief. I could not resist this opportunity to share my memories of the Tournament. 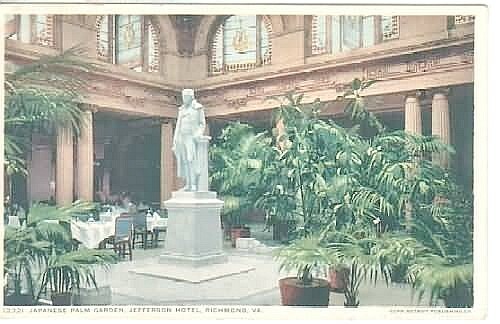 Of course I, like everyone else was very excited about the games and wanted to go to Richmond and stay in a hotel with my friends. 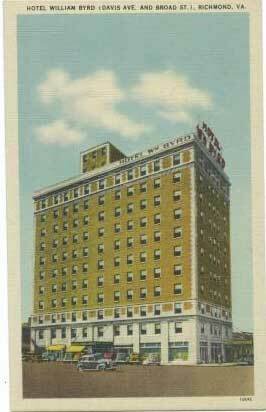 My father steadfastly refused to allow it but said he would DRIVE US up there every night!!! I grudgingly consented, knowing that if I made too much noise I would not get to go at all. 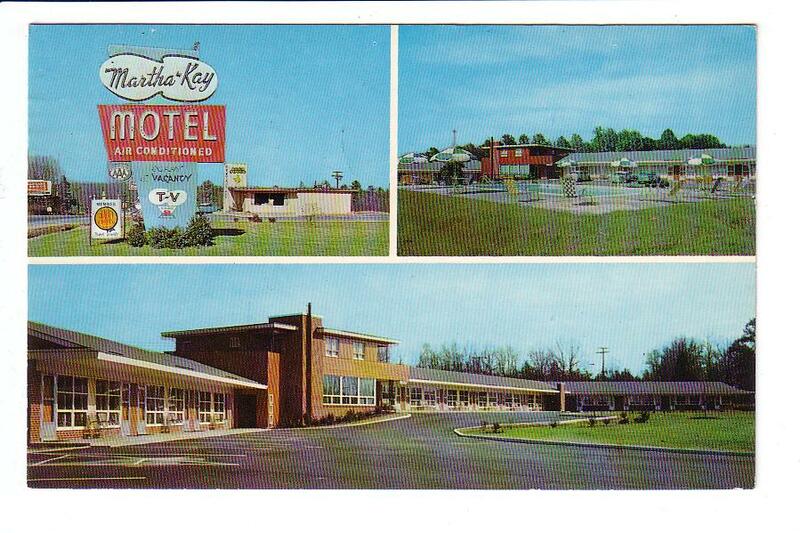 Well, we attended every night, he drove me, Patty Eken, and Anne Davidson. 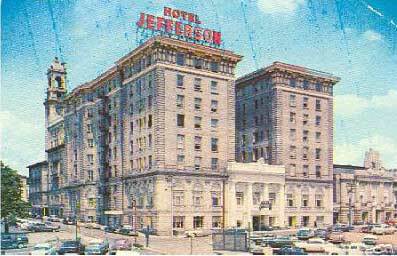 Later on I heard that some kids got into trouble, threw mattresses out the window, TVs out the window...and were kicked out of their hotel. He said "See, you could have been in that group." I patiently explained to him that I would not have done those things but he insisted that I could have been presumed guilty and evicted just the same...One of the times in my life that I was REALLY REALLY MAD at my Dad and did not forgive him 'til I had teens of my own!!! It was still such fun to be there and cheer for our wonderful winning team!!! Now Rocky Gary is my brother-in-law! A couple of years ago my son went with his now wife to watch her sister play in the state championship tournament. 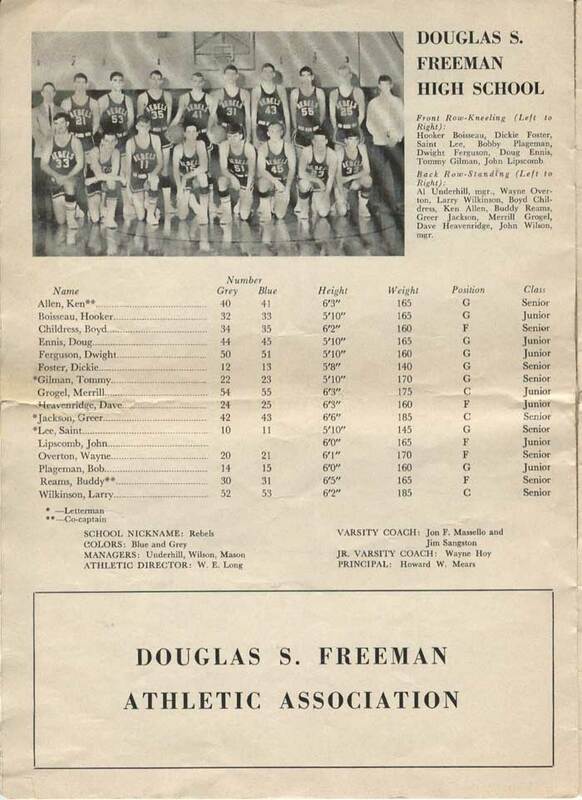 He bought a program that had listed all the state champs, boys and girls, to that date. I had told him over the years how NNHS was always a power in BBall, and that we had won more state championships than any other school and still held that record even though the school had been closed over 30 years. I guess he must have taken that statement with a grain of salt as the old man bragging about his high school. SO, when he looked at the program, lo and behold, Dad had told the truth!! 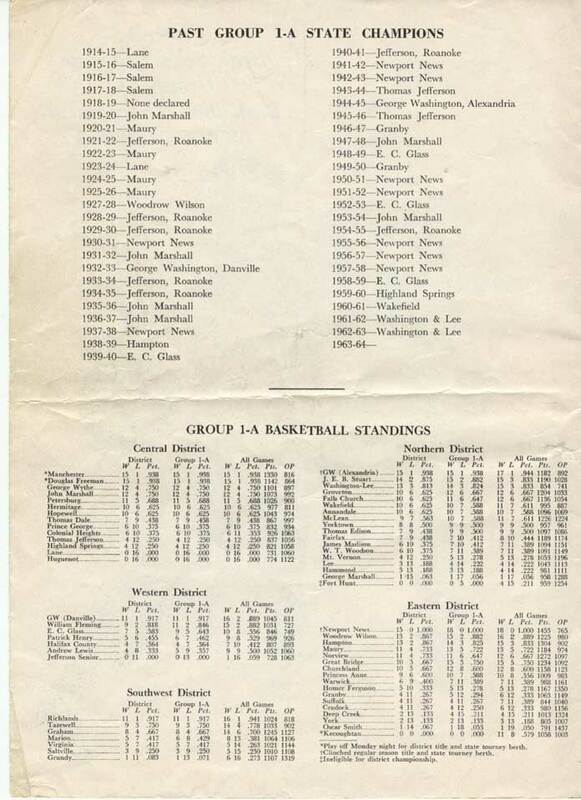 We went through the years together and counted, including 1964, 12 state championships - not the ten that the sports writer listed in the article on your site. We STILL hold the record!